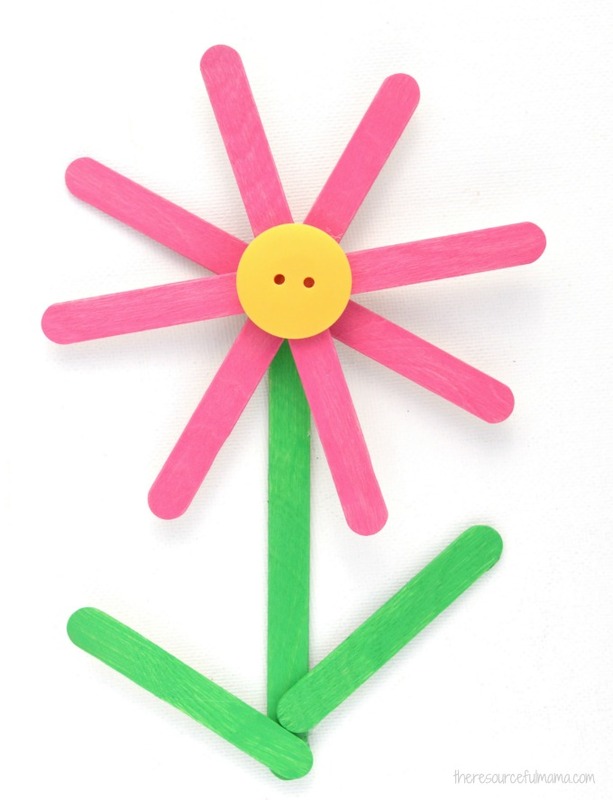 Turn craft sticks into a bright and colorful Popsicle Sticks Flower Craft kids will enjoy making both spring and summer. I count down the days to flower season almost like the kids count down the days to Christmas. The kids and I love filling our pots and flower beds with bright and colorful flowers in the spring. Then we leave for an extended period of time every summer to visit extended family and hope that they are kept alive while we are gone and just as pretty when we return. The basis of these popscile stick flowers start off the same, but with a little paint kids can really personalize these to make them their own. Be sure to scroll down and see how our kindergartner painted her popsicle stick flower craft. We used two different sized craft sticks to make this flower craft: popsicle stick sized for the petals and stem and mini for the leaves. You will need five regular sized craft sticks (4 for the petals and 1 for the stem) and two mini craft sticks for the leaves. I used buttons for the center of the flowers. You could also use pom poms. We changed the steps slightly during the process making of these. I made them ahead of time and painted all the individual craft sticks, let them dry, and then glued them together. While this method worked fine, it was a little messier and I knew it would be harder for the kids to paint each individual piece. Before the kids made them, I glued the mini craft sticks for the leaves to the stem and then glued the craft sticks for the petals together. To make the flower’s petals, start off by gluing two popsicle sticks together to form an X. Glue a popsicle stick on top of the x, so that is perpendicular to the x and then another popsicle that is horizontal. You could also make two X’s and then glue those together. I used a glue gun to assemble the pieces. If your kids want to help assemble the pieces, my kids have this Ultra Low Temp Glue Gun and it works great for them. Now it’s to time add paint. Our kindergartner added her own colors and unique design to the the craft sticks (the flower’s petals). Once all the pieces were dried, I added a button to middle of the craft sticks glued together to form the flower’s petals. Our kindergartner choose to skip this step for her popsicle sticks flower craft.